I grabbed This Journal Belongs to Ratchet, by Nancy J. Cavanaugh, from the New Arrivals shelf at the public library. When I opened it up and realized that it was written in diary-type format, I knew it might be a good book to suggest to those kid who enjoy books like Dork Diaries and Wimpy Kid. Instead of being a straight-forward diary, this book is written in different styles. Some pages are poetry, some pages are graphic organizers, some are essays. This book would be a good model of what a writers notebook with many different types of writing might look like. Ratchet, aka Rachel, lives with her dad and is homeschooled. She doesn't have any friends. They move around often as her dad finds houses to fix-up. She spends a lot of time each day working on cars with him in the garage. (This made me laugh because I often help my husband work on his cars in our garage. I know way more about tools than I ever wanted to know!) When her dad isn't working on cars, he is speaking at City Council meetings about saving the environment. Ratchet is annoyed and embarrassed by her dad. She has made a new goal for the year: to be less like her dad, and more like her mom. The problem is, she doesn't remember anything about her mom. There is a mysterious box in her house that her dad hides from her, and he is not willing to answer any questions. In addition to learning about her mom, Ratchet wants to make a friend. She tries a girls group at the library...which doesn't go well. Then, her dad is ordered to teach a class on building go-carts at the library and she has to help. From the start, it doesn't go well. There are some boys who constantly make fun of her. But there's another boy, Hunter, who doesn't. Ratchet finds out a lot about herself in this story, some things she wanted to know, and some she didn't. And she finally finds a friend in the place she least expected it. This book would be a great bridge for kids who have been reading a lot of graphic novels, but are wanting to read something deeper. It's a perfect fit for my fifth grade classroom library! 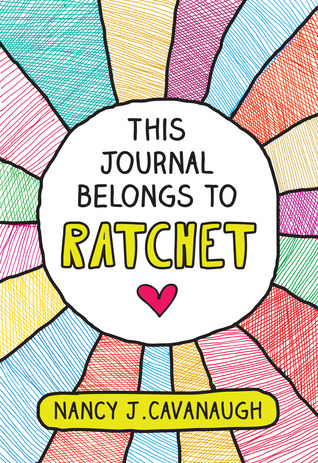 Have you read This Journal Belongs to Ratchet or other books like it? I'd love to hear what you think! Thanks for the lovely review, Christina! I hope your fifth graders enjoy RATCHET as much as you did!